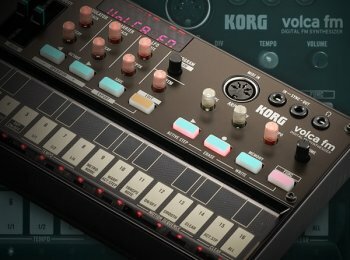 Studio pro Larry Holcombe brings you an in-depth series on the wildly popular KORG volca fm hardware synth. Explore what this small but mighty synth can do and learn all about its features and functions, how to operate and program it, as well as some cool sound design ideas! Larry begins with an introduction to FM Synthesis, and then starts at the beginning with the KORG volca, covering how it executes FM synthesis, its Edit Menus, Keyboard Functions and Global Parameters, followed by front panel controls and how to load and save sounds. Next, see how to play and create patterns with its built in sequencer, use the powerful Arpeggiator, how to make a blank starting patch to build upon, and then more specific topics like Level Scalling, the LFO, Pitch Envelope, and using Velocity. Wrapping it up, Larry covers the Algorithms, Sound Design Concepts and Feedback, which is essential to programming sounds on the volca fM, followed by step by step videos on designing a Bass and Pad sound. See the individual tutorial descriptions for more info. If you're new to the KORG volca fm, or just want to go a little deeper into understanding and using its features, this is the video series to see. Watch "KORG volca fm Explained®" today!